In 1875, Mr. L.J. Wing, a Yankee inventor, founded the L.J. Wing Company with his invention of a disc fan with variable pitched blades. Mr. Wing produced many notable inventions and was recognized by the American Institute for his outstanding achievements. These include his introduction of the first steam turbine driven fan in 1905; his development of the first floor mounted steam unit heater in 1917; and also in 1917, a test on the U.S.S. Kimberly using L.J. Wing 'pressure type' fans that resulted in over 200 World War I Navy ships being fitted with those ventilation fans. In 1920, L.J. Wing revolutionized the heating industry by producing 'The Featherweight Heater' which utilized a lightweight copper heating coil and became the first overhead unit heater. This led to the first Door Heater in 1921, the first integral face and bypass make-up air system (L.J. Wing’s FAS) in 1933, and the first rotating discharge nozzle in 1939. During World War II, L.J. Wing's total manufacturing capacity was directed to the production of ventilating fans that were used on virtually all Naval landing and cargo ships of that period. After World War II, the L.J. 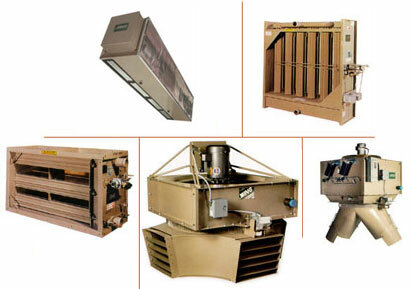 Wing Company introduced the first Integral Face and Bypass Constant Volume Coil in 1961; the Vari-jet discharge in 1963; Gas Assembly Heaters with mounting heights over 100 feet in 1965; the Genex in 1985 (the first rotary heat exchanger indirect fired gas heater); and the Door Air Curtains in 1998.